The book was out of print, so I ordered it from amazon.com. I’m glad that I did. I spent the year of 2008 going through this devotional. A wonderful journey it was. The book is divided into 52 chapters to be used as 52 weeks of devotions. But each “Week” actually has two or three qualities of God to study, so it really amounts to about two or three devotionals for each week. For example, Week Four is a devotional on God is Carpenter, Potter, and a Working God, Week Twelve is on God as Living Bread and Manna, and Week Twenty is on Discipliner, Teacher/Master and Rabbi. You get the idea. Herr has a very descriptive writing style. For example, in Week Eleven she describes God’s omniscience by saying, “grace without God’s omniscience would be as elusive as a hollow wind whistling through the broken window panes of an empty church” (p. 72). She also has keen insights into the character of God. In Week Eighteen, she says this about God’s as Resurrection and the Life: “So, when He chooses to let our dreams die so He can give us a resurrection rather than a healing, we sometimes feel abandoned” (p. 114). Each section lists scripture readings for further meditation on that particular quality of God. I found that looking up those scriptures was almost as enriching as the text of her book. 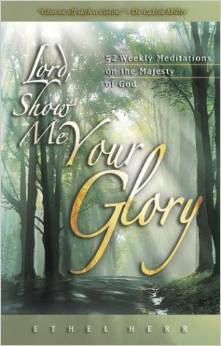 The experience of going through this book will help you understand the character of God in a powerful way. If you are looking for a practical devotional that is all about you and how you live your Christian life, this is not it. But if you are looking for a devotional that will make you forget yourself and will leave you in awe of our wondrous God, bowing before Him in worship, then find a used copy of this rare gem of a book online and order it.